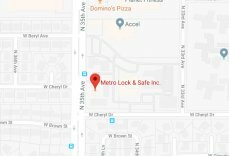 Securing Your Home | Metro Lock & Safe Inc.
Posted on February 14th, 2013 by Metro Lock & Safe Inc. If you are a homeowner, the thought of home security has probably crossed your mind at some point or another. Whether you live in a highly populated city or a rural area, it is important to take certain precautions when securing your home. Many individuals consider purchasing a home security system that includes an alarm and outside monitoring. Whether or not you choose to purchase an alarm system, the following tips will help add an extra layer of security to your home. It may surprise you to know that the traditional doorknob lock is not the best way to provide security to your home and occupants. Several professionals state that a doorknob is really more of a convenient way to enter your home. If you are looking for the best way to secure your home without an alarm system, install and use a deadbolt lock. Many professional locksmiths will tell you that a properly installed and consistently used deadbolt will deter would-be-thieves from entering your home. There are single cylinder deadbolts as well as double cylinder deadbolts. A single cylinder deadbolt operates by a twist knob on the inside of the door and a key on the outside of the door. A double cylinder deadbolt only works by using a key on both the inside and outside of the home. After choosing which type of deadbolt system to install, make sure the lock is properly installed. The deadbolt should extend fully into the hole. Additionally, the hole must be reinforced with a metal plate. If the bolt isn’t the correct length or if a metal strike plate is not in place, the door and lock can be compromised and a thief may be able to force entry. Many families routinely leave a spare key underneath a doormat or in a nearby flower pot or under other furniture items. Most experts agree that this practice should be avoided in order to provide greater home security. If you need to have a spare key close by in case of emergencies, use a lockbox or leave the key with a trusted neighbor. The last thing you want to do is provide a potential thief with easy access to your home. Finally, if you have recently purchased a new home, consider hiring a locksmith to have your locks re-keyed. With numerous showings, agents, etc. it is impossible to know who still has a key to your new residence. There are many professional locksmith companies who can take care of your needs in a matter of minutes. Taking the necessary steps mentioned above to secure your home will deter thieves from easily entering your home. These steps will also provide you and your loved ones with a sense of peace and security.